ItemE-02789 - Ross Camp During The Construction Of The Grand Trunk Pacific Railway. ItemD-06434 - Unidentified group at Fort St. James, BC. ItemD-06440 - Loading packhorses onto a flat-bottomed boat at Stuart Lake, Fort St. James, BC. ItemG-04118 - Fort St. James, BC. ItemG-04120 - Unidentified group at Fort St. James, BC. ItemD-06441 - Stuart Lake, Fort St. James, BC. ItemD-06448 - "Portion of Front Street, Juneau, Alaska, april 5, 1909." 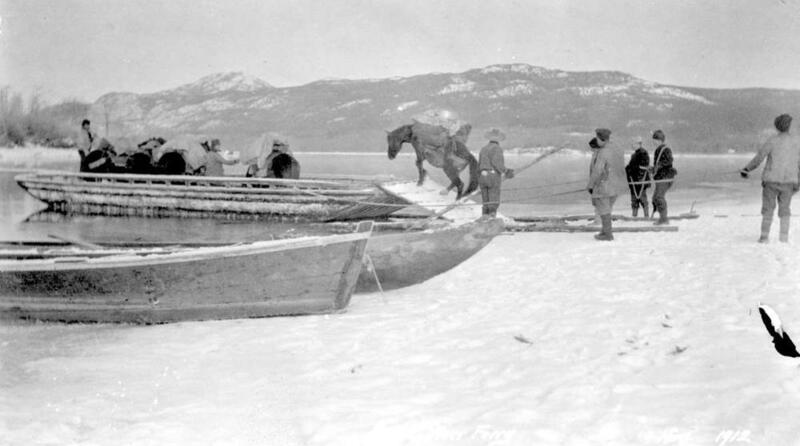 Item D-06440 - Loading packhorses onto a flat-bottomed boat at Stuart Lake, Fort St. James, BC.